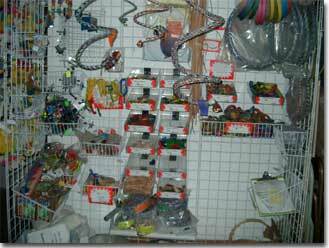 Avalon Aviary has a wonderful walk-in store with an enormous supply of bird toys and a large selection of other high-quality bird supplies. We carry many unique items that come from our own bird toy company, TLC Bird Toys™, and from other manufacturers that make things exclusively for us. 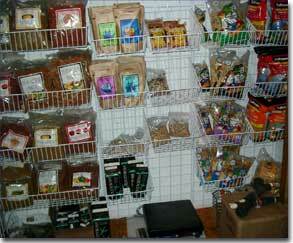 Our knowledgeable staff can assist you whether you visit us or call for mail order. Don't see what you are looking for? Let us know! We can probably obtain it for you. Why should you purchase your bird products from us? First, because we have the products you need for your bird at reasonable prices, and if we don't have it we will try to get it for you. We have knowledgeable staff that can help you with your selections. And we have most items in stock and can ship promptly. Second, because you vote with your dollars. If you believe that the world needs ethical, high-quality breeders who put the birds first, and who provide excellent customer education, please don't spend your money with places that do the opposite. Puppy mills and feather factories and the stores that support them are what validate the unreasonable efforts of the radical animal rights activists to make all pet ownership illegal. By purchasing from those places, you are voting with your dollars. Without your business, we cannot continue to exist and make a difference in the lives of so many birds and their people. Third, because a percentage of our profits go to support highly selected, reputable parrot rescue and conservation programs. By buying products from us you are also helping birds in need, both captive and in the wild. 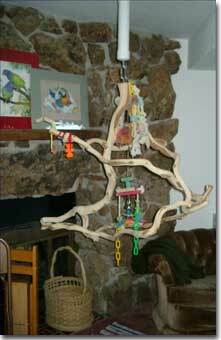 Bird toys for every size of bird, and for every play style! We have a broad range of destructible, indestructible, noisy, snuggly, privacy, foraging, preenable, moveable, take-apart, swing-from and hand held bird toys for birds of all sizes and experience. 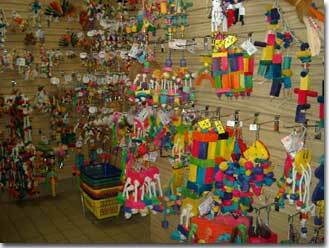 We also have our own bird toy company, TLC Bird Toys, which makes many unique items. We bought this company that was going to close up because they never made a toy that our birds didn't love! Plus we carry an ever-expanding range of parts if you want to build your own. We provide top-quality parrot cages (both powder coated and stainless steel) at competitive prices. We also offer roosting shelves, many kinds of perches, spare feeding cups (including indestructible, dump-proof cups) perch height adjusters, toy hangers that can't be opened by your birds, privacy tents for sleeping and other handy parrot cage accessories. Primary cages, travel cages, sleep cages. Some bird cages for less destructive species are also available. We carry natural branch perches (with bark or sandblasted manzanita), indestructible perches and rope perches. We also carry perch height adjusters that prevent perches from sliding down your cage bars, and can be used to secure swings in dome-top cages. For beak and nail grooming we offer Sandy Perch® grooming perches. For bathing we offer shower perches. For aerobic exercise we offer a wide range of bird swings and bungees. We also have ceiling stand-offs to protect your ceiling, and bungee stands in case you don't want to make a hole in your ceiling. We have plastic chains and ladders to build climbing skills and to help your bird get back up from the bottom of wherever. We offer an assortment of tabletop, floor standing and hanging play stands. These play stands are made from parrot beak-tough easy-to-clean plastic (Parrot Tower®), sandblasted manzanita wood (sandblasting this incredibly hard wood makes it not so slippery, so birds can perch with confidence) we also have grapevine, which is much more difficult to destroy. We carry a range of food for parrots of all sizes including Harrison's Bird Diet® organic pellets and mashes (at 20% lower price than their on-line prices), Scenic® pellets and hand weaning food, plus an assortment of other pellets. We also offer some lovely special seed mixes. We provide many kinds of nuts year round, including macadamias. We also have a range of soak n' cook products, sprouting mixes, sprouting equipment and sprouting instructions. We have a range of food cups, including indestructible and dump-proof cups. For making food more fun we have some wonderful foraging toys where you can hide treats, plus bird-safe stainless steel skewers you can hang in the cage to entertain your bird with large hunks of food. Walk with your bird outside on a bird leash. Keep your bird safe when going outdoors or on a trip with easy-to-clean, airline approved, bird beak-tough carriers equipped with perches for good gripping and places to hang toys on the side. Collapsible travel cages (for when you arrive at your destination) are coming soon. We offer bird-safe, aviary-approved disinfectant for deep cleaning your cage. 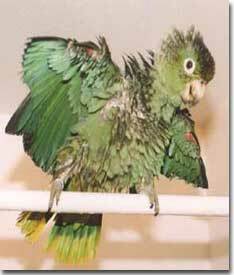 For bathing your bird, we have shower perches for all sizes of birds, plus mister bottles and sprayers. We have earplugs for people whose ears are sensitive to the occasional "squawking moments". We also offer a range of full-spectrum light bulbs and fixtures to help your feathered companions stay healthy winter and summer. These lights are good for you, too; they can help avert Seasonal Affectiveness Disorder (SAD) in people. We are expanding our offerings of first aid supplies. Companion Parrot Quarterly, Bird Talk and Birds USA magazines are on our shelves. We have a range of excellent books to help you learn about your bird, how to care for it, understanding its behavior and teaching it tricks. Included on our shelves is Sally Blanchard's Companion Parrot Handbook, along with a broad range of general care and species-specific information, plus special topics such as Bird-Safe House Plants, Parrot Toys and Play Areas, and a variety of trick training approaches. We offer both videos and books. We have a checklist to help you get started and know what your bird needs. We offer starter kits, complete setups, and discounts if you purchase your bird and cage and play stand from us. We offer gift certificates for that special someone who loves their bird. Toy-of-the-month club is coming soon. We have some lovely iron-on patches and beautiful jewelry. Some bird art prints are coming soon. We also offer earplugs for people with sensitive ears who live with loud birds.